The Beck Street location was our home for seven years. 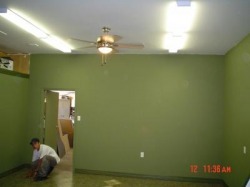 Here are some pictures of the showroom taken in various stages over the years. 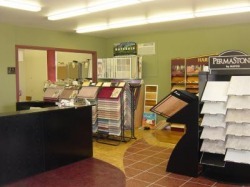 A view of our original showroom. 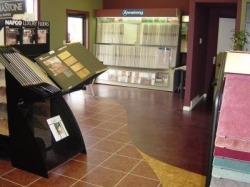 We chose to incorporate 4 different flooring mediums for the showroom and use angles and curves in the layout. 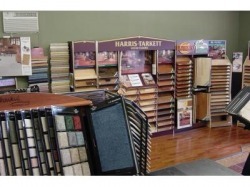 All to show the versatility and choices available to you when you start your flooring project. Sweeping curves are no problem for an experienced installer. Using different products is no problem. The only limit is your imagination. One of a kind projects are always a delight for us. 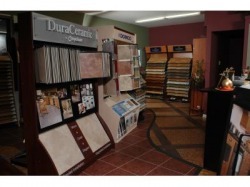 Here you see the merging of 3 products, from 3 companies: Armstrong Vinyl , Nafco Permastone Tile and Torlys Cork Tile. This picture shows the merging of Cork (Torlys), vinyl tile (Nafco-Permastone) and, for our hardwood center, Brazilian Cherry (Harris-Tarkett) from our exotic hardwood line. View of the original showroom from the entrance. Angles, curves and integration of different flooring products - your imagination is all you need to give your home a unique custom look! 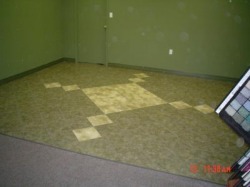 Our original location entrance floor featured Wicander Series 1000 Motion cork and Series 3000 Wood on Cork Bronze strip in a bordered squares pattern. It also featured Nafco Permastone. We were impressed with the way this floor took a beating and kept on looking great! 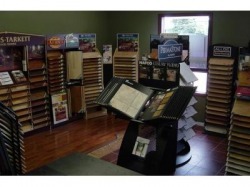 See for yourself with our full line of lifestyle solutions flooring. 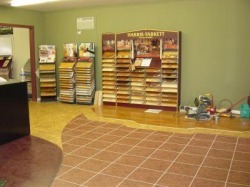 A closer look at the Nafco floor in the addition to the original showroom. A view of our original reception area close to completion. This picture shows the cork (Torlys-Burl Natural) and vinyl (Armstrong-Urban Settings) selections used approaching the reception area. 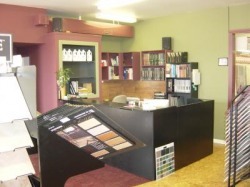 The showroom was designed for the customer's comfort and convenience. 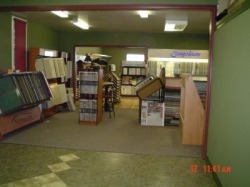 Another view of the original showroom. 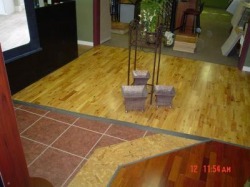 A view of the Australian Cypress Hardwood Floor in the main part of the original showroom. Here we see installer Stan Barrie (who was an apprentice at the time this photo was taken) work in the original showroom addition. This room features an inset of Nafco Claystone in a field of Nafco Elements. 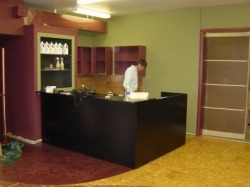 Looking through one of the additions (in progress) into the main showroom.